Son left at home, a summer job securely held in hand. Day two on a summer’s long-distance drive from High Level, Alberta to Qualicum Beach, British Columbia, nets a few moments driving respite in the valley beneath Mount Robson, Canada’s highest peak. With camera on tripod, I move behind the visitor’s center to find a field with yellows, purples, shapes and textures – all at hand. Everyone snapping photos – people in this place, recording their moments, here. Listening to – Dave Matthews’ Bartender. nice shot. and thanks for the visit. I’m liking your photo/thought blog – a quiet journey, a creative response to the day’s day and to Life. I’m liking the T.S. Eliot quote. you are welcome, Lumens.you also have wonderful photos. Beautiful photo! I love the light and the colours, which create a fantastic mood. And thanks for the like. I’m enjoying your birding photos, too. Thanks for checking things out, here and for the encouragement. 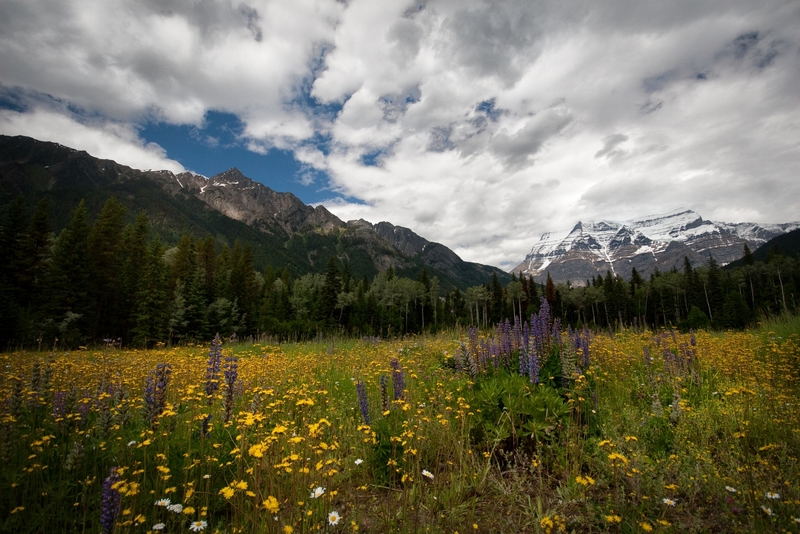 You’re looking at Mount Robson and summer photos … colour and setting. I’m feeling a little impatient for spring to be getting on and arriving. Are you? Or do you already live in a climate allowing warmth and flowers and greenery?